If you have travelled with me, you know how much time I spend to figure out the sunrise and sunset timings. If you have travelled to a National Park, you know how much I am particular about getting up before sunrise and arriving on the location to capture moments that are only seen for a few minutes each day and that too if you are lucky. My uncle and I went to capture the sunrise at the West Temple end and the sun was rising behind us. 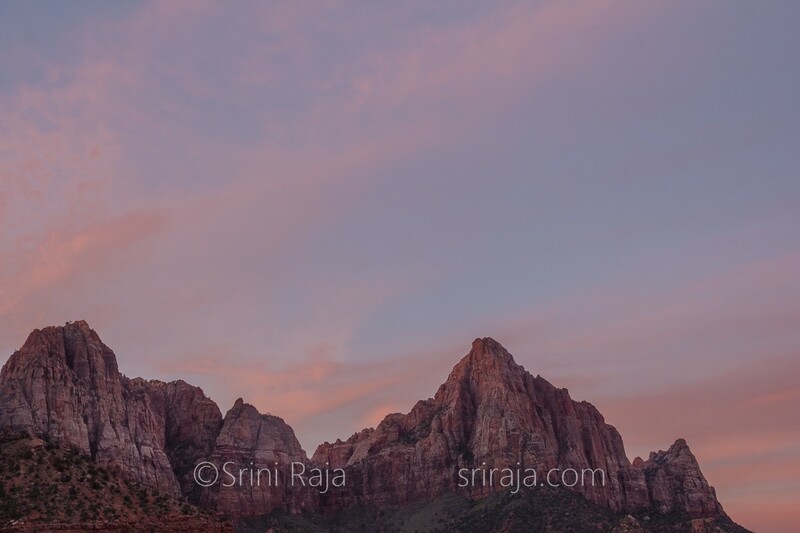 I was waiting for the sun to lit up the areas from West Temple to the Altar of Sacrifice and I suddenly looked back to see the beautiful pink glow of dawn and Watchman standing silently. The Watchman is the most photographed item in the park and very rarely people capture it from this location. But for me, it was awesome and I slowed down my camera to get the range of colors in its glory. This one photograph made my trip worth it and I have more beautiful captures from this trip to Zion. This photograph would not be possible without a tripod and I highly recommend it for anyone into serious photography. You are wasting your time without one.